During the time of study, Mackenzie realized that literature is a noble and passionate, but not always allowing you to pay the bills. She began to look for work in new York and got to interview famous hedge Fund D. E. Shaw, which was successfully. One of the first employees of the Fund with which she spoke, was a young Jeff Bezos. Bezos was working through the wall from McKenzie, and she could not hear his loud laughter. The laughter her and conquered: McKenzie calls it love at first hearing. The girl began to invite Bezos to lunch. Bezos himself became interested in the new employee. He was impressed by not only the appearance. Before meeting with his future wife he read her summary and noted good results on the SAT exam (test for admission to universities in the USA). Events unfolded with the speed of delivery Amazon Prime: after three months, Bezos made an offer, and three months later, Mackenzie tuttle became Mrs. Bezos. A year after the wedding Bezos told Mackenzie about an interesting fact that came across while studying the market for tech companies: using the Internet is growing at 2,300 percent a year. Bezos and Mackenzie began to think, what product would be ideally suited to Internet Commerce. And decided that it should be a book. At that time the world was three million different books, and none of the store could not accommodate such a number. Jeff told Mackenzie that he wanted to quit work and start an online book store. And she supported him, although for a couple it meant a complete loss of stability: the Bezos assess the probability of failure is 70%. I must say that even this assessment was very optimistic. As analysts, Jeff and Mackenzie knew that the statistics show that the average probability of failure of startups is 90%. The pair retired from D. E. Shaw in the summer of 1994, depriving yourself of the bonus, and moved to Seattle. Mackenzie just followed Jeff into the world of uncertainty, but also became the first employee of a startup it, going with my husband side by side all the stages of a long history of Amazon: garage, basement, warehouse, office, smelling of fried food, the Christmas madness of distribution centers and an IPO. First Amazon contracts with contractors were concluded it Mackenzie. The growth of the company and turning it into an online giant, Mackenzie gradually moved away from the operating management, although he continued to support her husband in matters of strategy. Mackenzie Bezos is the complete opposite of Jeff Bezos. She is an introvert and tries to avoid public events, making rare exceptions, for example for presentations. By the way, Mackenzie took ten years to finish his first book “the Testing of Luther Albright”. Amazon and the birth of children was very time consuming. But for this novel, released in 2005, Mackenzie Bezos was awarded an American literary prize. Her second book “the Trap” was released in 2015. Despite the fact that Amazon has its own publishing house, Mackenzie Bezos prefers to work with a traditional publishing house Harper and Knopf. Once, when Jeff Bezos was asked why his wife another publisher, he joked that Mackenzie — “the fish that he missed.” The irony is that the wife of the man who built “store only” is a representative of the publishing industry — it is the one which suffered most from the triumphant March of Amazon. Many independent bookstores refuse to sell books Mackenzie. 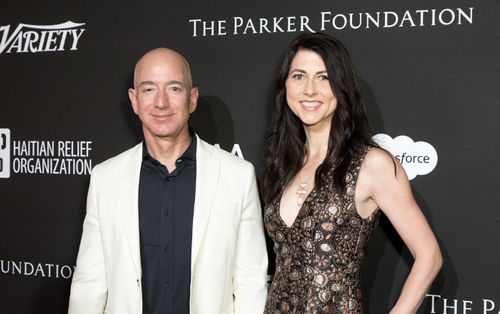 After 9 January the pair in a joint statement announced the divorce, there was a prophecy that soon and Mackenzie Bezos will become the richest woman in the world. Yes and no. When Amazon was only ten people, each of them had a share in the company. And according to the law of the state of Washington (where Amazon was and live Betsy) property acquired jointly belongs to both spouses. So technically the wife of the richest man on the planet for a long time has the status of one of the richest women on the planet.